Visible priority: Attendance is a visible, ongoing priority within the school and throughout the community; school websites, newsletters and other communications with parents stress good attendance. Ongoing message: to parents and students is that good attendance is important, possible, expected, and fun! Part of the school culture: Interactions with students and parents about attendance are aligned with a positive school climate. Prevention-focused: Engagement efforts and recognition for improved attendance occur at all three prevention tiers (universal, at-risk, high-risk). Family-focused: Engagement and recognition activities include parents as well as students. Aligned with other school policies: All school policies complement and are consistent with the positive philosophy promoted through attendance policies (e.g., use alternative to suspensions, access to prekindergarten slots are not dependent on students' attendance). Engagement is a long-standing priority in education and positive recognition of students' successes is a tried-and-true practice. These key elements need to be applied to attendance in such a way that good attendance is a well-accepted part of the school culture. find ways to collaborate and problem solve (i.e., listen and learn about the reasons for a family's absences and identify mutually agreeable solutions). Efforts to promote good attendance are particularly successful when an individual is designated by the principal to assume this responsibility. establishes the expectation of good attendance as part of the school climate. Messaging about good attendance is directed to all students and parents; it's not limited to chronically absent students absent. is more effective if responsibilities only focus on building a positive culture for attendance. For example, this may result in a conflict of roles if the attendance officer serves as the attendance coordinator. With the assistance of Ready Freddy, school staff, along with community volunteers, welcome kindergartners to their new school, highlighting to families and students that regular attendance is a key component to school success. Many school districts have expanded their school breakfast program using Community Eligibility provisions, which has been a means of getting students to school each day and on time. School breakfast has been shown to increase attendance and promote achievement. Consider ways teachers, as well as parents, can help children deal with changes and adapt to school more easily. At student-parent orientation, invite both parents and students to participate in the Washing the Elephant activity so all are reminded of the impact absences have on learning. Encourage students to participate in extracurricular activities and after-school programming so they feel more engaged with the school. Have students assist younger students during the breakfast program. Intramural sports schedules have been adjusted in some districts -- moved to the morning instead of after school -- as a way to get students to school. Arrangements have been made with the local library so that older high school students can use PLATO and complete course requirements for graduation at a local public library; this reduces the stigma overage students may feel being with other younger students. Many school districts and community organizations nearby schools conduct or host quality after school programs that support students and their families. 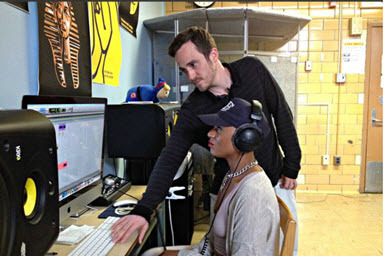 See how Hip Hop Therapy boosts attendance at a Bronx high school. Use school events, like Back to School Night and Open House, to stress good attendance and make the connection between attendance with school success. Each month, enter the names of students with 95% attendance or improved attendance into a drawing for a prize. Congratulate students with improved attendance during morning announcements. Host friendly competitions and award classrooms with good attendance (e.g., Popsicles on the Playground; Traveling Trophy). Use positive communications with parents to emphasize attendance as a priority in all school events and activities. Recognize parents for their efforts to help improve their child's attendance (e.g., flowers, key chain with child's picture, family night gift basket, family tickets to high school play or sport event) using low-cost incentives. Use school events to orient and remind parents about the importance of good attendance; school expectations for student attendance and on-time arrival; school attendance policies and the school contact person who can assist them. Build relationships with families through activities like the Weekend Backpack Partnership program, where backpacks of food are sent home with children. This type of program has been shown to improve students' attendance.